Herbicide resistance poses a challenge to agricultural productivity and profitability. It’s an issue facing all growers, but increased awareness and adoption of best practices can help to minimize the impact in your fields. Chadrick Carley, Syngenta’s agronomic services manager, Western Canada, attended the recent Herbicide Resistance Summit in Saskatoon, Saskatchewan to build his knowledge on the growing threat. The bi-annual conference hosted by Top Crop Manager was intended to increase understanding of herbicide resistance and promote awareness that everyone has a role to play in managing it. “It’s important to keep up with current issues that growers are facing and researchers are investigating,” says Carley. He reports that conference attendees included industry members and growers alike. The two-day event featured presentations by leading researchers. Two presenters who stood out to Carley included Peter Sikkema, professor of field crop weed management at the University of Guelph, Ridgetown Campus, and Tom Wolf, founder of Agrimetrix Research & Training in Saskatoon, Saskatchewan. Cereals like malting barley are great rotational crops because they are very competitive and, in combination with higher seeding rates and good herbicide efficacy, you'll reduce the amount of weeds that emerge after application. Growers should consider this advantage as part of their resistance management strategy. A presentation by Wolf (aka ‘The Nozzle Guy’) provided some enlightening information on ‘Managing resistance with sprayer application technology.’ What does herbicide resistance have to do with application technology? According to Wolf, research conducted in the U.S. shows that under dosing can be a source of herbicide resistance. Fortunately, growers can make application tweaks to ensure weeds receive an accurate rate of herbicide. Wolf’s research shows there are areas in the field where we're over and under applying herbicides. This is largely due to the mechanics of the sprayer (e.g. boom height, boom swing) and tractor speed. His work also shows that consistency across the sprayer isn't as uniform as a grower may believe. We're doing quite well at applying ‘x amount of water’ over ‘x amount of acres,’ but the distribution may not be consistent. For example, if we wanted to do 10 gallons an acre, we were getting 10 gallons an acre on the field, but some areas may see 6 gallons and some may see 12 gallons. View all of the presentations from the 2018 Herbicide Resistance Summit here. We're here to support you and strengthen the malt barley market. 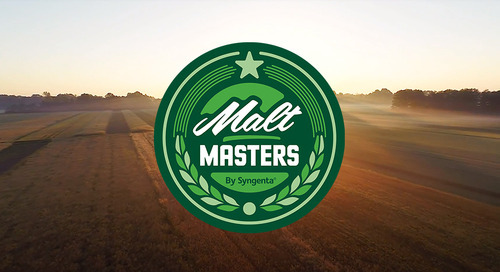 Malt Masters can connect you to the experts and information that you can use to improve your odds of making the grade.